Google+ Mom to 2 Posh Lil Divas: Last Day to VOTE for Mom to 2 Posh Lil Divas - Top 25 Teacher Mom Blogs! 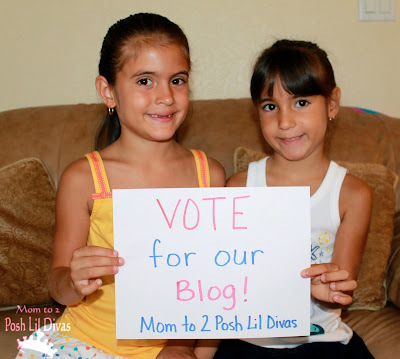 Last Day to VOTE for Mom to 2 Posh Lil Divas - Top 25 Teacher Mom Blogs! The end is near and the finish line is in our sights. We are so close to finishing out #1, WooHoo! on Circle of Moms Top 25 Teacher Mom Blogs. I love what we do and share here on our little blog. This is a piece of our lives I share with you all. giving us your support and providing feedback. When I started this little blog I had no idea anyone besides my family and friends would be interested in what I do at home with my girls. I can not tell you how much it still surprises me that you are all out there reading this (haha!) but YOU inspire and motivate ME to do more, to think outside the box, to continue sharing. For that I thank YOU. but I wanted to thank you for being here. Thank you for letting me share with you each day. Thank you for inspiring me and letting me inspire you. this blog would be a lonely place! 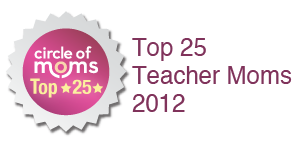 on Circle of Moms Top 25 Teacher Mom Blogs! Yay! Thank you so much Tiffani Rose!